Regal (introduced on December 4) wove a perfect web. She'd been constrained by the dense shrubbery, so I carefully pruned it away. 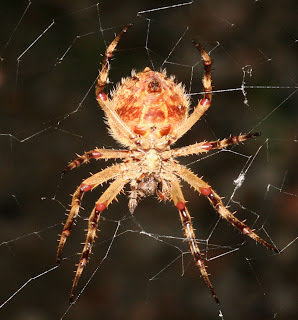 Last night she wove a full sized orb web. 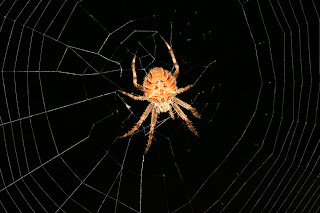 The full web would have been well over a metre across - they are capable of much larger. The orb was about 80 cm in diameter. She is only about 2 cm in body length. Pretty good achievement? Clicking on the images will show you Regal in all her glory. 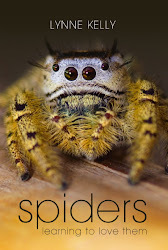 The beauty of these spiders is the way you can see all their body parts. Here's Regal from the other side. 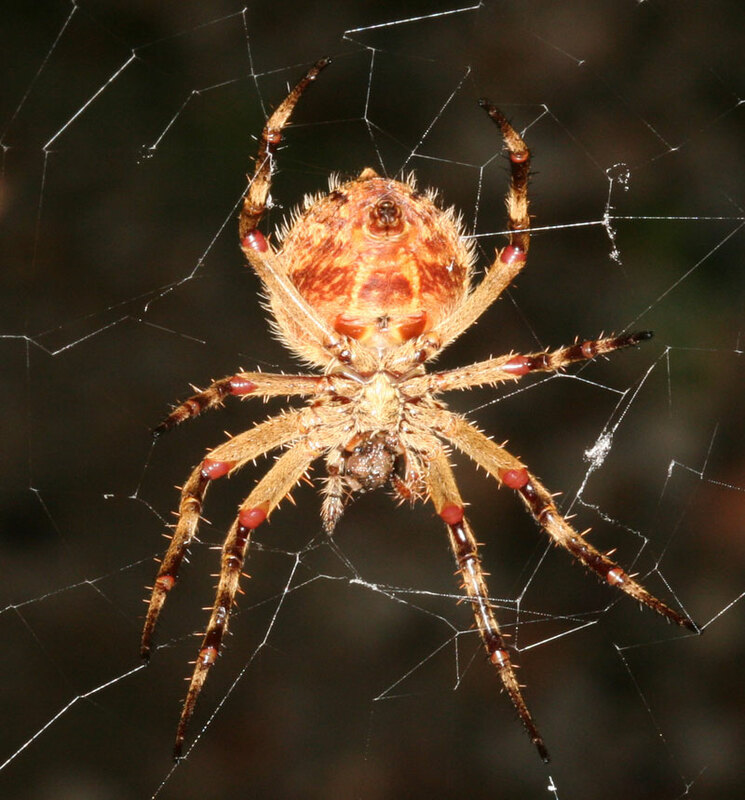 At the tip of her rear end are the spinnerets, where she pulls up to 6 different kinds of silk to make her one web. Humans haven't managed to make any material as strong and light, and certainly not at room temperature. Incredible stuff - very flexible, impervious to water, rot and fungi - and incredibly strong for its weight. Her main guy thread across the top, which she reinforces every night, is really strong to touch. There is a good reason the birds keep pinching webs for their nests. 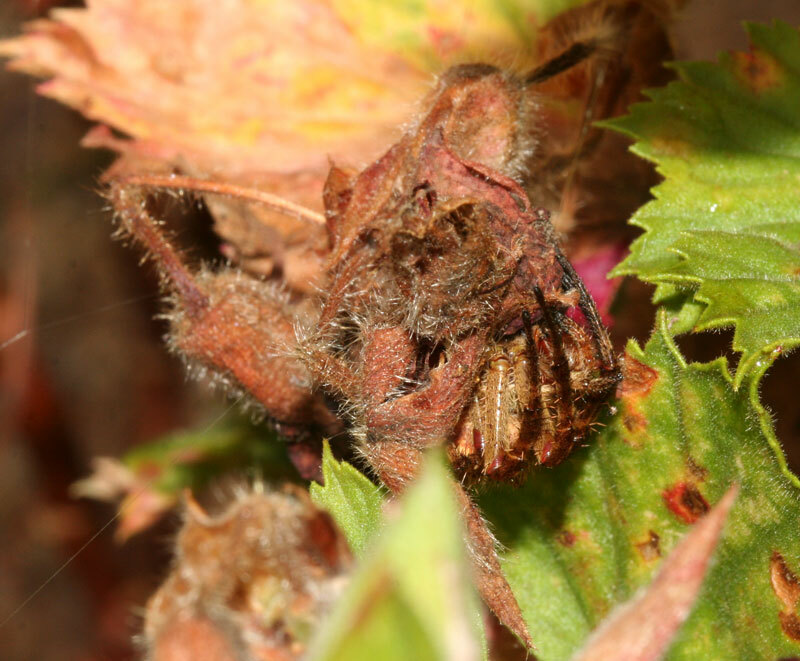 Directly below Regal's spinnerets, just above her waist (pedicel), is her epigynum - the reproductive tract. On either side are her lungs. Despite the way many people draw them - you can see clearly that all her legs come from the cephalothorax - none from her abdomen. The blobby bit at the front is something she is eating - just finishing, judging by what a mess it is. The mini-legs / pedipalps / palps are a bit like hands, and used for all sorts of manipulations. Regal detects the world by feel. Her eyesight is pretty pathetic. But those hairs, especially the stiff ones you can see, are incredibly sensitive. So she knows what's going on through touch. Her web is, in effect, an extension of her sense of touch. Spiders are hairy, because otherwise they wouldn't know what was going on in their world. And here she is at rest today. You can see why she's the colour she is. Those dreaded birds would be hard pressed to see her. She's on the right of the dead leaf mass. I have a feeling Regal is going to be the most photographed spider in the world. Rocky (one of the wolf spiders introduced on December 4) has moved the bit of bark in the photo, back over her burrow. She is not the first wolf spider I have had who loved a particular bit of bark. Theresa, whose story I told in the book, had a roll of bark which was always near the edge of her burrow. One day her burrow was dug up by the large birds who dig up lots of my wolf and trapdoor spiders - the white winged choughs. They didn't get her. That night, she emerged, still with some young on her back, covered in dirt, and started to repair her burrow. The first thing she did was go and get her roll of bark and bring it back to the burrow entrance. She then descended for the night. It took her two weeks to fully repair her burrow. Pity she wasn't so lucky at the next chough attack. Rocky's burrow is very exposed, so I hope she escapes the notice of the choughs. At the moment, with her bit of bark over the burrow, I doubt any bird would detect her. The burrows are usually wide open when there is just the one spider there. When they have young, they keep covering and uncovering it. I hope to see Rocky's young soon. Like all wolf spiders, she'll carry them on her back for a week or two. That's the photo I want to put here.